Here we are, a third of the way through January already. I know that the new year is really here by a variety of signs. Yesterday was my girlfriend’s birthday, just as it is every January 10, whether I remember it or not. The Christmas cards I mailed to apparently incorrect addresses three days before Christmas are starting to show up in my mailbox. Too bad, so sad, you didn’t tell me you moved so you miss out on our newsletter. I know, you’re heartbroken. Deal with it. There is a giant pile of laundry waiting for me to wash, but I have been reluctant to do so, remembering the annual phenomenon of clothes shrinking in immediate post-holiday washes. It’s somehow related to my scale adding a few pounds out of spite just because I’ve been avoiding it lately. The total due on the credit card bill I received today was not the same as the running balance in my head, or even on my Post-it© notes (and really, how can you argue with a Post-it© note?). We are not thousands, or even hundreds, of dollars apart but I still feel betrayed. I thought I was being so responsible. Time was when I considered the new year off to a good start if I had all three kids’ snowsuits clean at the same time. They’re long gone now and doing their own laundry (although I’m not sure about this week – that whole post-holiday shrinking thing and all). So now that they’re gone, I think I should be wiser, I should have more time to get things done, I should be more organized, I should, I should, I should. 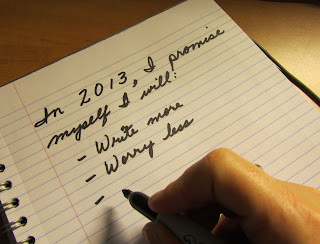 I’m tired of “I should.” I’ve decided I’m not going to make resolutions. I’m going to make promises to myself instead. Promises are more daunting than resolutions, so they have to be made more thoughtfully. One of mine is to connect with you through this blog more frequently this year. Others relate to facing personal fears, emulating people I admire, doing my best, and telling people the good things I think about them. All good things. Oh, and not taking on too much. That, too. No resolutions for me either! I don't like the concept. Just do the right thing (whatever it is) every day!